24th-25th March 2012. While this workshop was not exactly the best attended ever, it was nonetheless quite an enjoyable weekend for those who attended. 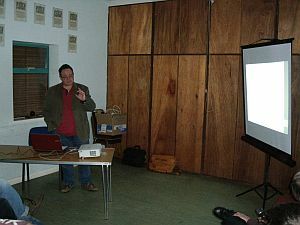 George Gwilt started the weekend with a talk on the subject of Big Numbers. Not the price of fuel or bankers' bonuses, this talk sought to build on the articles he is writing for QL Today and to show how some heavy duty theory and assembler coding can be made relevant to us all. He demonstrated how integer representations can be used to calculate decimal numbers to given numbers of decimal places, for example, and how putting a few simple SuperBASIC procedure wrappers around the assembler code can make such a difference to ease of use - once more we see how powerful the QL BASIC can be when well used. As a prime example, George demonstrated how his combined assembler and BASIC routines could calculate values such as 'e' to a given number of decimal places. He even challenged the audience to state how many decimal places and of course his routines calculated any reply almost instantly. Meanwhile, the second presentation got cancelled in embarrassing circumstances - yours truly had left it at home. It would have been about a new program dock system, called Q-Dock. The quote of the weekend for me came from Rich Mellor. Having brought a monitor to sell on his stand, I heard Rich call out "Who plugged a QL into my monitor?" - as if he wasn't expecting to see a QL at a QL workshop! 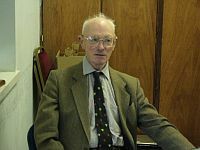 The next quotation comes from Quanta Editor Lee Privett, who revealed that earlier in his working life he used to desolder chips by applying a blowtorch to the underside of a circuit board and then whack the board against a table to dislodge the chips while the solder was still molten. Remind me not to let him repair my QL should the need arise! Perhaps I'm being a bit unkind, as he still had his arm in a sling following a recent operation (not from all the translating of a Spanish adventure game he was doing during the weekend) and had been driven to the workshop by his daughter all the way from Essex! Meanwhile, two Dutch visitors (Bob Spelten jr and Leo Moll) revealed they had been shopping at the large Trafford Centre and left without spending anything at all! Obviously, nothing QL-related there, then! It was nice also to see one or two new faces at the workshop. 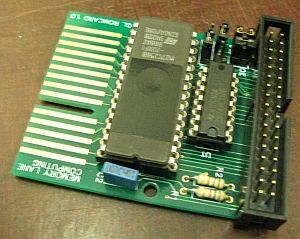 We have already found out in the last year or so that the QL Forum, for example, has been able to draw in some new QL users in recent times, including some returning to the QL scene after an absence and some who start using a QL for the first time due to an interest in retro computing. We are also finding that there is a renewed interest in systems which can help with learning to program again, rather like we used to in the 1980s. 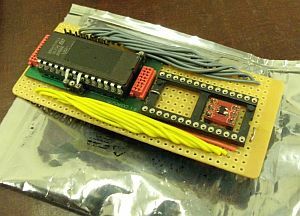 The QL is a reasonably open design and has good availability of documentation so is an ideal little hobby computer in this respect. 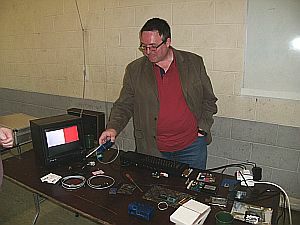 We had hoped to have Adrian Ives of Memory Lane Computing come along for the weekend to talk about his SerUSB, Q-Bus and QL SD Card interface. Sadly, travelling all the way from Cornwall by car he was unable to arrive in time on the Saturday, but joined us for the Quanta Dinner in the Pond Quay restaurant later, where no less than 21 people sat down to a delicious Chinese banquet. A good enough excuse to continue talking about all things QL. On Sunday morning, Adrian Ives joined us and set up his hardware expansion units for the QL, including the new QL-SD card interface for the QL, which may come in two guises, one where it takes the place of microdrive number 2, allowing the MDV2_ slot to be used for inserting an SD card, and another where the SD card interface plugs into the ROM slot behind the QL, for those who would rather not remove MDV2_ from their QL. Adrian was working on some issues with noise pickup (probably from the video modulator) when the interface is mounted in the MDV2_ slot but confident he can in time overcome those. 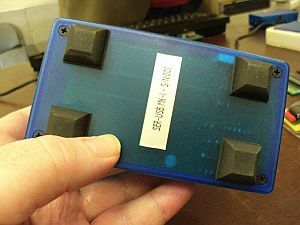 He later gave a presentation on his work, where the interest was so great the room was packed full of avid listeners and after the talk, Adrian's table was surrounded by those interested in the QL-SD card interface. Adrian was also able to take advantage of borrowing some Gold Cards and Super Gold Cards etc to test that the QL-SD system was compatible with them. Not so good was the news that the life of the SerUsb interface may be all but over for two reasons. 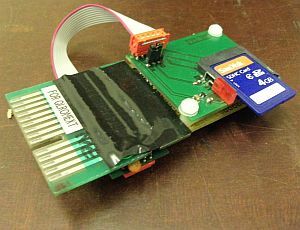 First, the USB-whiz device used in the device is discontinued and also the new QL-SD card interface will be able to read and write to the SD card much faster than the one on the SerUsb (which is limited by the speed of the QL serial port). During the talk Adrian also discussed his new driver system (EDDE and all that - see Adrian's article in QL Today from March 2012). I didn't quite understand the theory well enough to go into it here, suffice to say it is an expandable and adaptable system making it easier for designers to write driver code which will be easier to integrate as part of a wider system. Not to be outdone, David Buckley brought along a robot. Or robots to be precise. 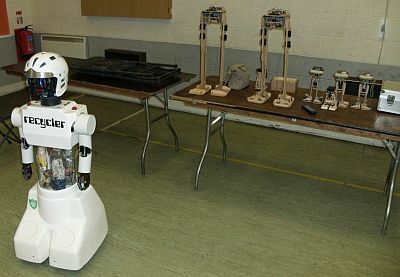 Varying from small wooden bipeds right up to an educational and friendly large white plastic wheeled robot (pictures below), at times David seemed like a shepherd counting his lost sheep as the robots walked off all over the place, including sometimes out of the door! 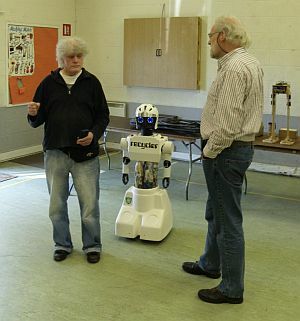 David has a long standing interest in robotics and last year demonstrated a turtle-style robot called Zero-2 programmed via a serial cable from a QL. David explained how well children react to and interact with these robots, a bit like interacting with a pet in some cases, and of course some of the robots were programmed to interact with you in a limited fashion. For example, the ultrasonic transducers are mounted to look like eyes. 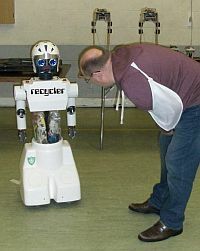 The big white robot was an educational recycling tool which can interact with youngsters to help teach about recycling, for example. The robot played back recorded messages, danced its arms to music, had blue LEDs on its face so could easily be made to look as though it was looking at you and following your movements, sometimes uncannily so. Rich Mellor had also brought along his new QL Games Collection 1 pack, a pack of ten games which are designed to run on a Windows based PC under Q-emuLator for just £10.00 and available from SellMyRetro.com. To quote Rich, "We hope this will help distil the comments that the QL was only ever a business machine and will hopefully help promote the QL itself." Committee members were filming some of the proceedings and videos will be available on the Quanta website in time. 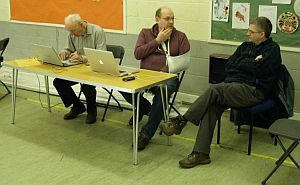 The AGM commenced at about 2pm and there was a lot of business to go through. Dan Abbott has resigned as webmaster and Keith Dunbar has resigned as Treasurer, although Keith will now take on the webmaster role. Sarah Gilpin remains as Chairman of Quanta this year and John Gilpin returns to the committee as the new Membership Secretary and Treasurer. The new constitution was voted in by a large majority, but one Special Resolution, to reduce the term of office for an Officer from 3 years to 2 years, was defeated. Some hilarity ensued when it was spotted that some columns of figures in the accounts did not add up correctly. This was traced to the fact that when the spreadsheet of accounts was included in the little AGM booklet an error had occurred in the column ranges, leading to it accidentally adding the year '2011' to the totals. Luckily, this only applied to the printed version - the ones presented to the auditor were correct and certified! After the AGM a brief committee meeting was held where among other things it was pointed out that 2014 will be the 30th anniversary of the QL and Quanta and the whole QL community should plan ahead for an extra special event during that year and a few suggestions were discussed. Anyone with ideas and suggestions is welcome to contact the Quanta Committee. We also need to look at trying to find new venues for Quanta workshops and would consider applications from individuals as well as from sub-groups who can offer a suitable venue. 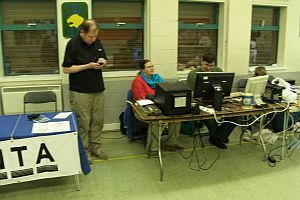 The fairly low attendance this year also means we need to look for ideas on how to try to encourgae more QL users (not just members) to attend. Here are some of the pictures I took at the meeting. Remember that non-members are always welcome to attend the Quanta workshops! Picture of the very first Ser-Usb device, serial number 001! Alsion Southern and family deeply engrossed, while Chris Grogan looks on.